Thinking of visiting Jakarta between 24 Feb to 4 March? Don't miss out on the 1,000 seats going for just 10¢* each from 10am to 2pm today only. 10¢ fare is only available for one-way travel from Singapore, excludes taxes & surcharges. 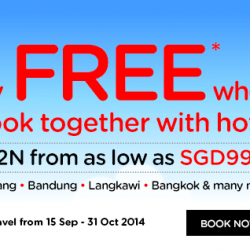 Fly direct to Bangkok from Singapore from base fare SGD6* one-way. Check out the following attractions in Bangkok and get discount up to 30% when you flash your AirAsia boarding pass. Madame Tussauds, Siam Ocean World, Nanta Show, Art in Paradise in Bangkok, Siam Niramit, Let's Relax, The Sanctuary of Truth. Expedia is offering you Hot Year-End Travel Deals. Enjoy Year-end Travel Bonanza with deals at up to 40% off! 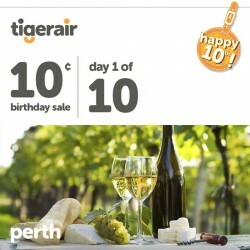 It’s day 2 of TigerAir birthday celebrations! Seats to so many great destinations are going for just 10¢* each. 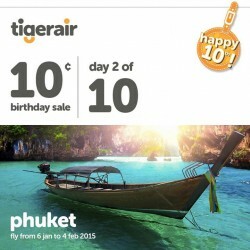 Fly to Phuket with 10¢ fares only from 4pm to 8pm. Travel between 6 Jan to 4 Feb 2015. 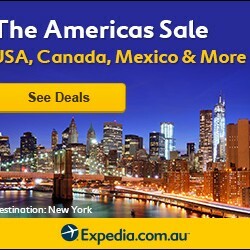 Expedia is now having The Americas Sale on! 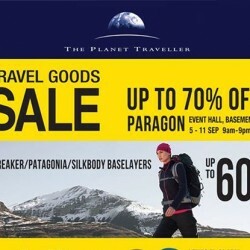 The sale will run through 22 Sep 2014. Offering destinations include USA, Canada, Mexico and more. Travel Period: By 30 Nov 2014. Sale Period: 0700 – 0900 hrs 9 Sept 2014 (Tue). Get set for your next adventure with your DBS Live Fresh Card! Enjoy US$40 off bookings at PandaBed.com. Enter promo code LIVE<first 6 digits of your card no.>, e.g. LIVE411911 at checkout. Valid till 26 Feb 2015. T&Cs apply. 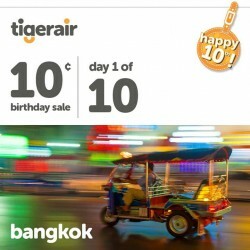 Tiger's birthday sale is now on! Each seat is going for a jaw-dropping 10¢. For 10 days, they will be unveiling 2 destinations every day at 9.30am and 3.30pm. Stay glued! 800 seats for sale to Perth from 4pm to 8pm for today only! 800 seats to Bangkok are up for grabs from 10am to 2pm only. Enjoy 5% rebate on all flight or packages booked by 14 Sep on ZUJI! 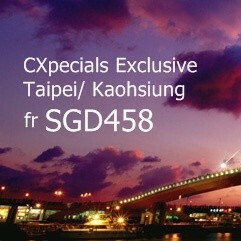 Get more out of your trip to Taipei or Kaohsiung with this fantastic two-to-travel offer with . Take a break to Taipei and Kaohsiung from $458. 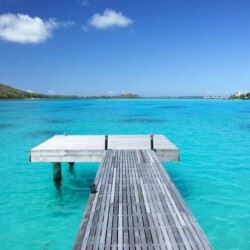 Need a vacation soon? 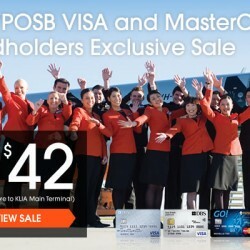 Check out the great sale fares from Jetstar exclusively for DBS/POSB VISA and MasterCard Cardholders only! 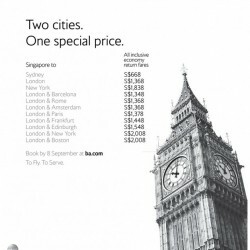 British Airways are now offering promotional airfares for multiple cities stopovers in Europe and USA. Prices stated are inclusive of taxes and surcharges but may be subjected to fluctuations due to currency changes. 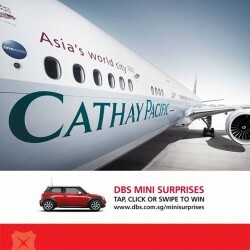 Welcome aboard the Cathay Pacific's Getaway Surprise. 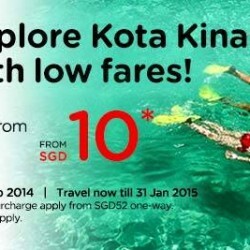 All-in fares to Hong Kong and more from just S$278. You’ll also enjoy a free upgrade to Business Class on SG to HK flights when you book on Premium Economy Class. Travel with a friend and you’ll also save with cheaper Two-To-Go Business Class fares! Book by 23 Sep 2014. Travel from now till 31 Jan 2015. Looking for cheaper airfares? 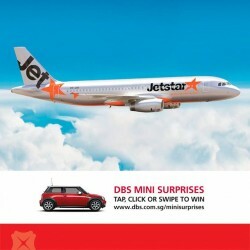 Book your flight at Jetstar with a DBS/POSB Card to enjoy exclusive discounts. 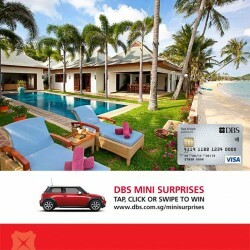 Simply enter the first 6 digits of your DBS/POSB Card as the promo code at checkout. 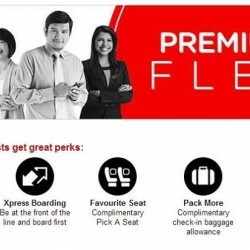 Enjoy flight change flexibility, Xpress Boarding, complimentary baggage allowance and more perks when you fly Premium Flex with AirAsia! 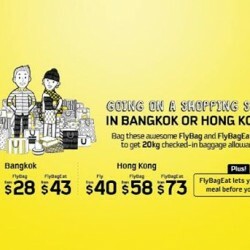 FLY LIKE A KING to Bangkok & Hong Kong when you upgrade to FLYBAG or FLYBAGEAT for 20kg baggage allowance and/ or meals onboard! Travel Period: By 28 Mar 2015. Sale Period: 1200 hrs (GMT+8) 3 Sept 2014 – 2359 hrs (GMT+8) 4 Sept 2014. 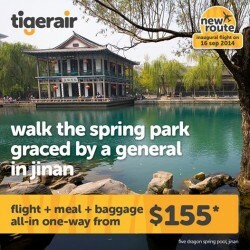 Tigerair has become the only LCC to launch direct flights to Jinan, China. To celebrate the launch, they are offering a special fare of $155 one way, inclusive of meal, 15kg baggage and $34 tax from Singapore. 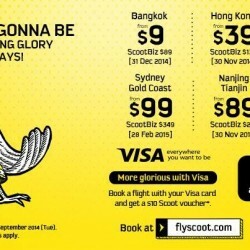 YO, Scoot Community! 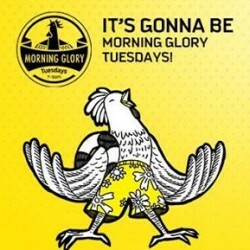 We think YOU should start planning your next getaway because our Tuesday Morning Glory offer is coming up tomorrow! Also, don't miss out on GOOD LOBANG such as 15% Discount for SEAT UPGRADES! 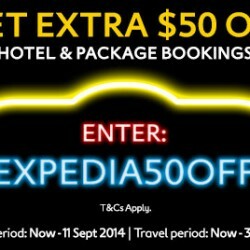 Expedia is having a from 1 Sep 2014 onwards. The sale is valid for one week only! 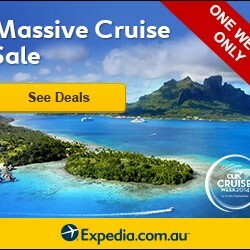 Hurry, book now to enjoy great savings. Fly free when book together with hotel. 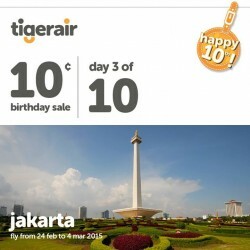 3D2N from as low as $99 per pax. Offering destinations include Langkawi, Penang, Bandung, Bangkok and many more. Hello September! You just need a holiday to wake you up when September ends! 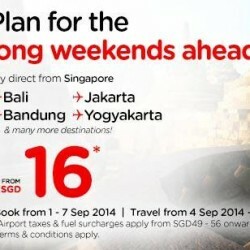 Plan for holidays during the long weekends to Bali, Yogyakarta and more destinations with AirAsia from base fare SGD16! Not in the mood to work today? Book some holidays then! 5% rebate for all flight and package bookings and enjoy 13% off hotel bookings on Zuji!